Rosalyn Bernay is on the run in 1879 London when she stumbles upon a unique opportunity -- to work backstage at a theater performing Gilbert and Sullivan's H.M.S. Pinafore. This job leads to new friends, possible romance, and the chance to act onstage. However, first she will need to escape her past ... and the people who pursue her. 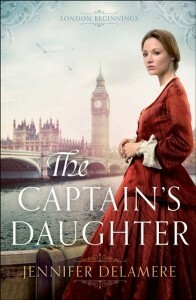 The Captain's Daughter is the first book in the new London Beginnings trilogy. This book focuses on Rosalyn, one of three sisters. It looks like the other two books will focus on her sisters. I enjoyed this novel and look forward to the upcoming books in this series as well. The historical details are very interesting in this book. I love Gilbert and Sullivan, so found the theater scenes particularly fun to read. I loved reading about backstage life. Rosalyn is a brave, admirable character. She keeps her faith in the midst of danger and stress, and remembers it as she begins a new life in London. I also liked Nate, a military man who recently returned from India. His rapport with Rosalyn was delightful, and their scenes together were particularly strong. The Captain's Daughter was a strong beginning for a new series, and I think other fans of historical fiction will enjoy it as much as I did. Recommended!